Once again, I have a totally yucky schedule this semester. 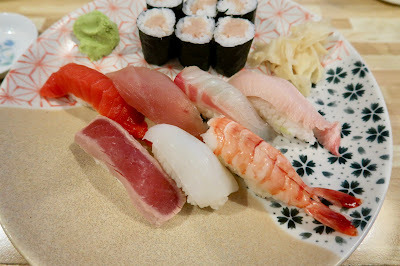 With only one day of the week to go out for sushi, I've often found myself having sushi twice in one day. Last Friday, I had a giant roll chowdown with the legendary Patrick for lunch, and just four hours later, I was at Tomokazu for an all-you-can-eat dinner with Enoch and his brother Luke. I consider it lucky that I got the chance to have dinner with Enoch and Luke because they are some of the most popular people at SFU. I don't think I've met anyone from my faculty who doesn't know either of them. Sometimes, it would take Enoch half an hour to get from one side of campus to the other (normally a ten-minute walk at most) because he has to say hello to about 20 friends along the way. 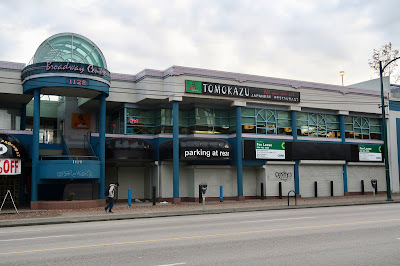 Tomokazu is the sister restaurant of Ninkazu in Richmond, an all-you-can-eat place that I used to frequent in my teenage years. Tomokazu was relatively empty when we entered, but by about 7 p.m., the large dining area was almost completely occupied. After we placed our orders, the food came lightning fast. In just 10 minutes, our entire table was covered with more than 20 dishes of food. I could not even snap pictures of the food as quickly as it came, much less eat it. It turned into one epic game of Snap-a-mole, which I epically lost. One of the first things to arrive was the Alaska Roll (salmon, avocado, lettuce, crab meat) and the Tomokazu Roll (tempura salmon, lettuce). 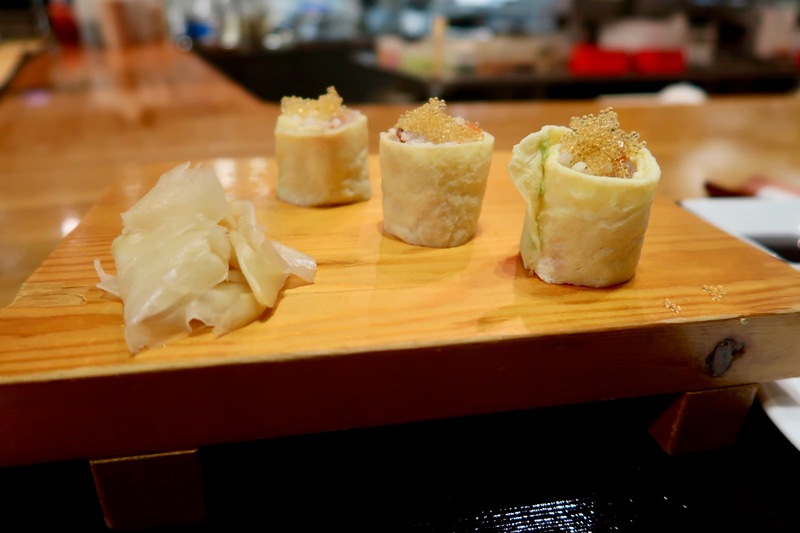 The quality of the rolls was in line with what I had at other AYCE restaurants. The Alaska Roll featured sweet imitation crab meat but was otherwise quite bland. The lettuce was obtrusive texture-wise. 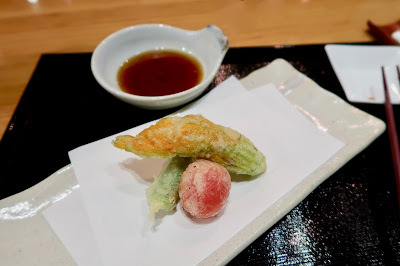 The Tomokazu Roll turned out to be moderately spicy and had sufficient flavour. 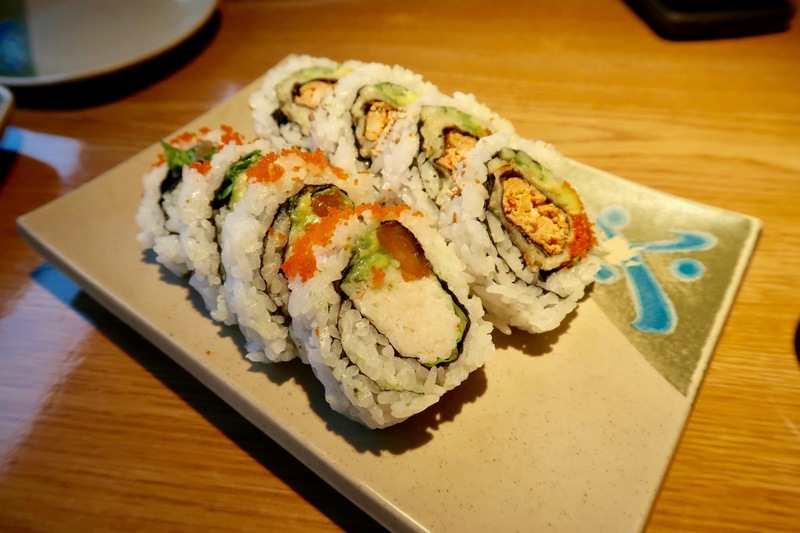 We had no idea what the Burning Kiss Roll contained, but it looked like an attractive choice on the menu. Who doesn't want a burning kiss? 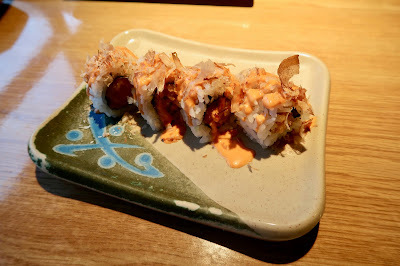 Featuring spicy tuna, spicy mayonnaise, and bonito flakes, the Burning Kiss Roll was quite spicy. The other ingredients did not stand out much, and the spicy sauce is basically all you taste. The Ebi Sunomono was a refreshing break after all that spiciness. The sunomono was on the milder side and rather acidic. 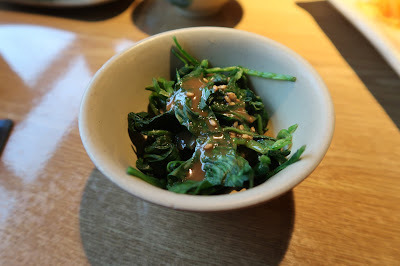 The Gomaae featured chewy spinach and thick peanut sauce. Luke took one bite of it and exclaimed that it tasted like chocolate. Yes, we all burst out laughing when he said that, although there was some truth to his claim. 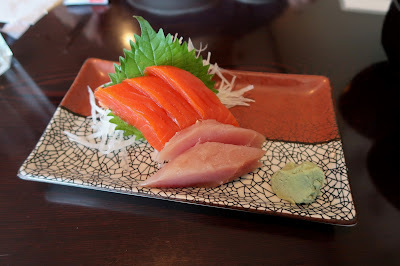 The Salmon Sashimi was noticeably fresh and had a nice, buttery flavour. The texture and thickness were also just right. It was the highlight of our whole dinner. 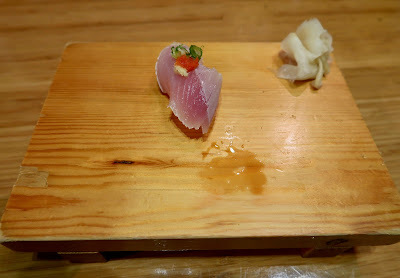 The Tuna Sashimi was somewhat soft and not as obviously fresh. 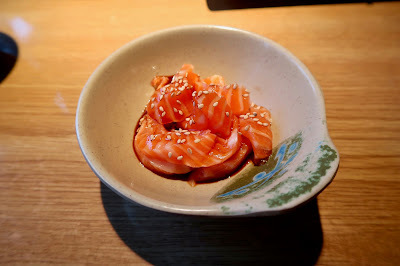 Another item that looked attractive was the Korean Salmon Sashimi, mainly because we had no idea what it was. It turned out to be salmon sashimi sliced into longer strips and dressed with a sweet, soy-like sauce. The sauce sort of dulled the buttery flavour of the sashimi. 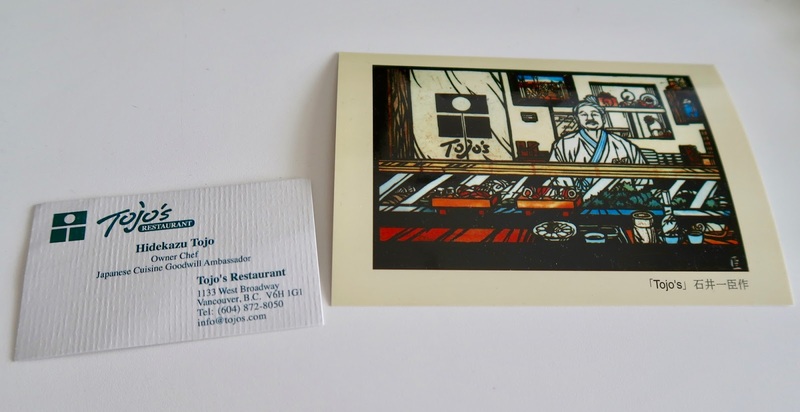 As Enoch is a big fan of tataki, we had several orders of the Beef Tataki and the Tuna Tataki. Each of them was sliced into very small pieces. 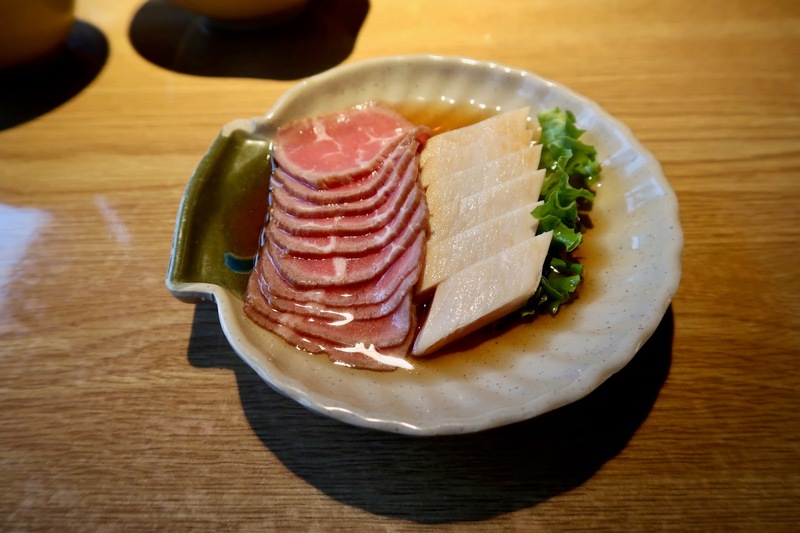 Each slice of Beef Tataki was about the size of a large haw flake. The Beef Tataki tasted virtually cooked, while the Tuna Tataki was overdone (which was hard to prevent due to its tiny size). 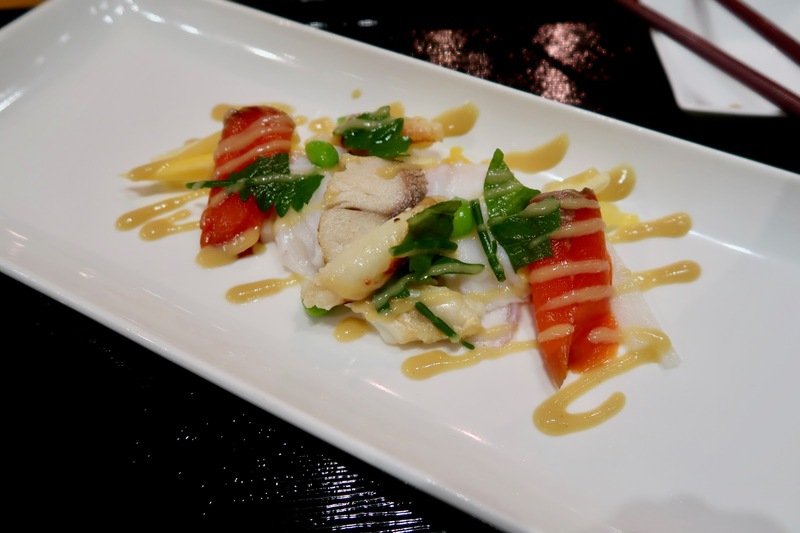 Tangy ponzu sauce lined the bottom of the dish. The Oyster Motoyaki came with a rich, greasy custard that had a strong mayonnaise flavour. Unfortunately, the oysters inside were tough and largely unchewable. Next, we got every one of the fancier-sounding types of nigiri on the menu. 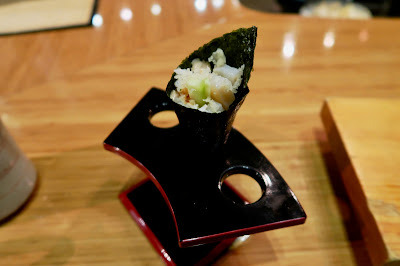 The Abalone Sushi came with a layer of wakame and small bits of abalone on top. 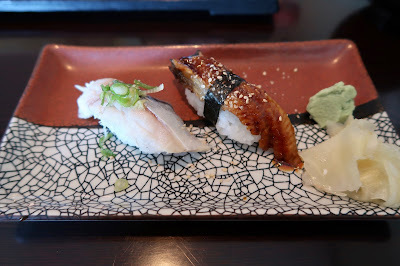 The sushi rice was packed quite tightly (as expected), and there was little abalone flavour. The best piece of nigiri was the Shark Fin Sushi, which was very savoury and came with sufficient moisture. It was mixed in with some jellyfish. The Lobster Sushi and the Chopped Scallop Sushi came in generous pieces, but were rather flavourless. 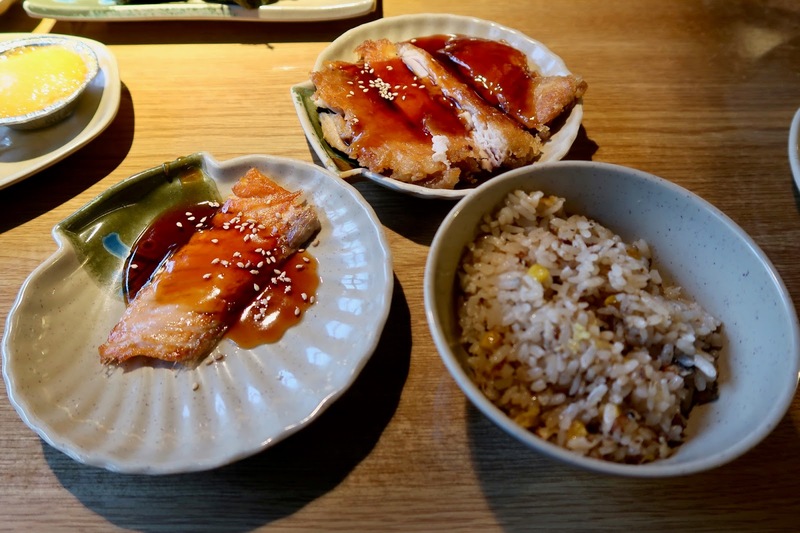 Onto the cooked food, the Salmon Teriyaki came in a thin slice and was slightly overcooked. The Chicken Teriyaki came with tender chicken, but the skin was a little hard to chew. The Unagi Fried Rice featured very little unagi, if any. The fried rice itself was undercooked. The BBQ Korean Pork and the New York Steak were both slightly overdone and a bit tough. However, that was not the case with the Beef Short Rib, which was surprisingly easy to chew, partially because it was also quite fatty. It came with a sweet marinade and exhibited a nice grilled flavour. The second-best item of the night was the Salmon Kama. It was juicy and savoury, and a light lemony zing accented the flavours well. 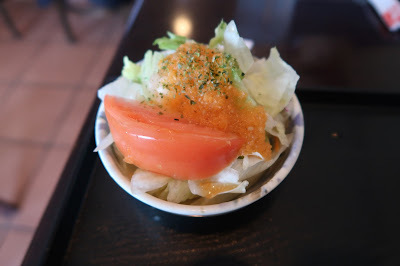 The Shishamo (smelt fish with many eggs) came with lots of roe and was crispy and salty. 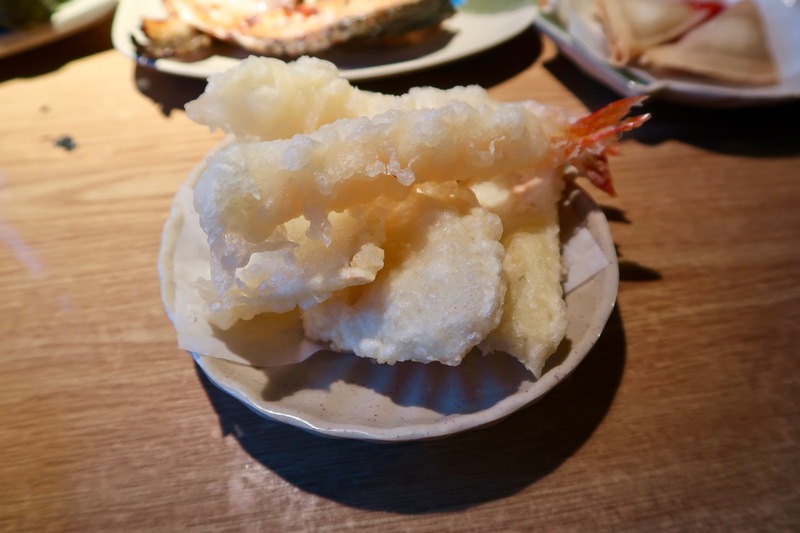 Many years ago, when I was a regular at Ninkazu (and hardly knew that better sushi existed), one of my favourite things to get would be the Prawn Tempura. 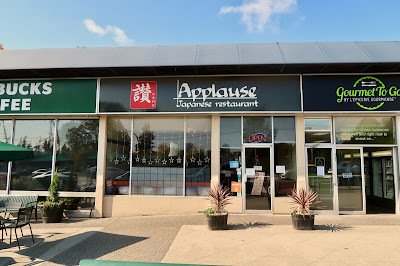 I remembered it to be surprisingly good for an AYCE restaurant, but this one was just okay. The batter was more greasy than crispy, though the prawn inside was still juicy. The Yam Tempura was slightly less greasy, but a little harder in texture. 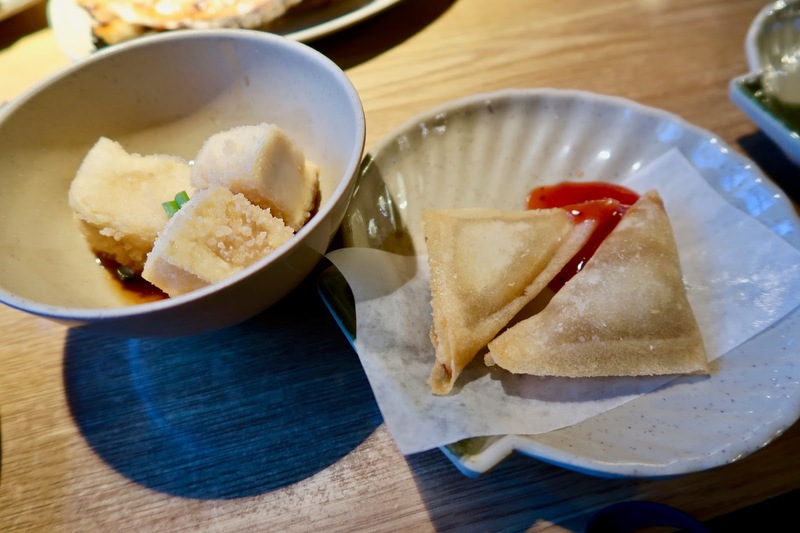 The Agedashi Tofu was crispy with soft tofu inside. The Vegetable Samosas were served hot and crispy and were accompanied by a dash of sweet chili sauce. It was like a spring roll but with a different shape. Upon Enoch's request, I shall rate the Slice of Orange as well. They actually attempted to make the Slice of Orange two slices, but because the cutting was vague, the two pieces were joined together at the bottom. The Slice of Orange ended up being about as big as a quarter of an orange and featured the central column of the orange. At the top of the slice, near the central column, were three orange seeds. The exocarp (exterior wall) and the pulp of the orange were a vibrant orange hue, while the mesocarp (interior wall) had a whiter appearance. Texture-wise, the Slice of Orange was not especially easy to chew. 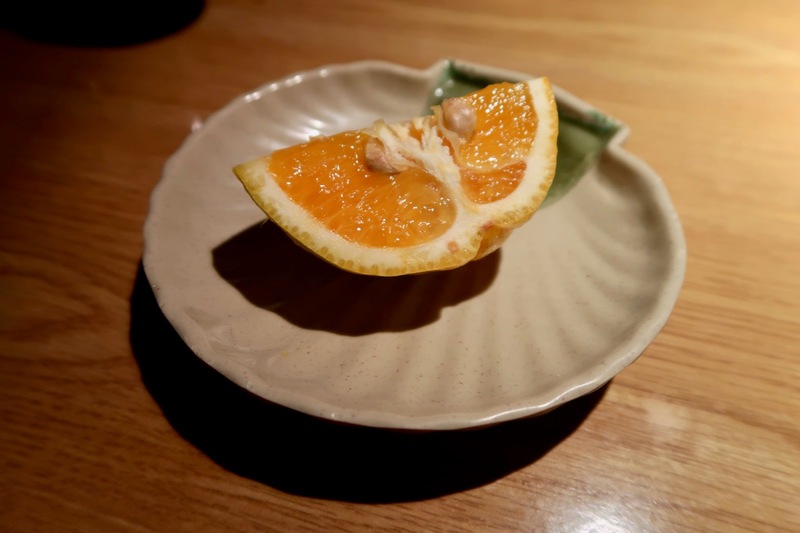 The taste of the orange suggested that the orange had not fully matured yet. It would have been nice to see a little more sugar content inside the orange. After all that food, Enoch still had the stomach room for multiple servings of Mango Pudding. I was out-eaten once again. Unfortunately, they didn't mix the ingredients in the Mango Pudding well enough, and it tasted rather powdery. 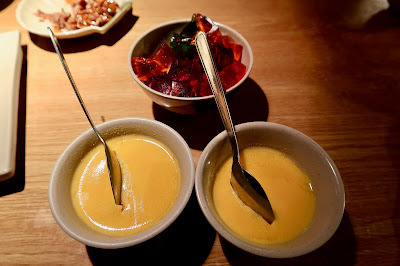 Some parts of the pudding had a clear, transparent colour. The Fruit Jello fared better and was juicy, sweet, and refreshing. 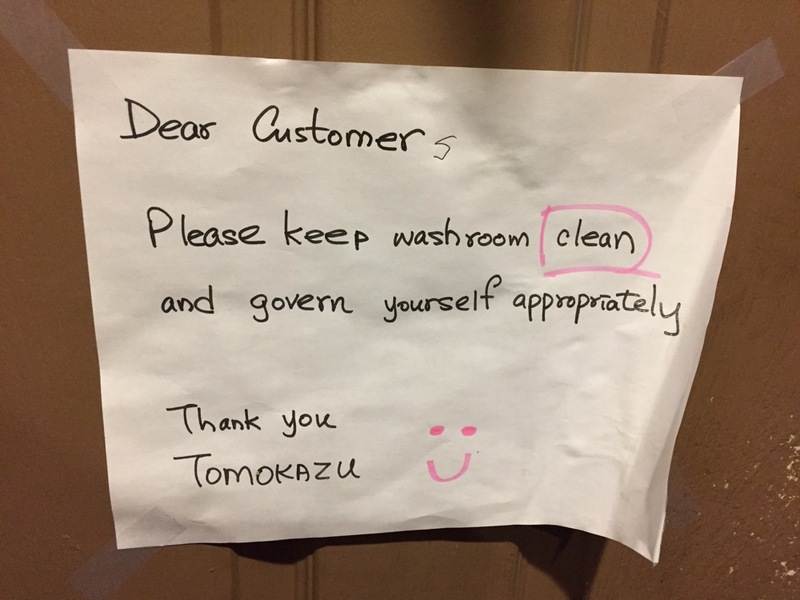 We had no problems with the service during our visit. However, they do stick to their two-hour time limit quite strictly, and we were asked to place our last call around 1.5 hours after we sat down. 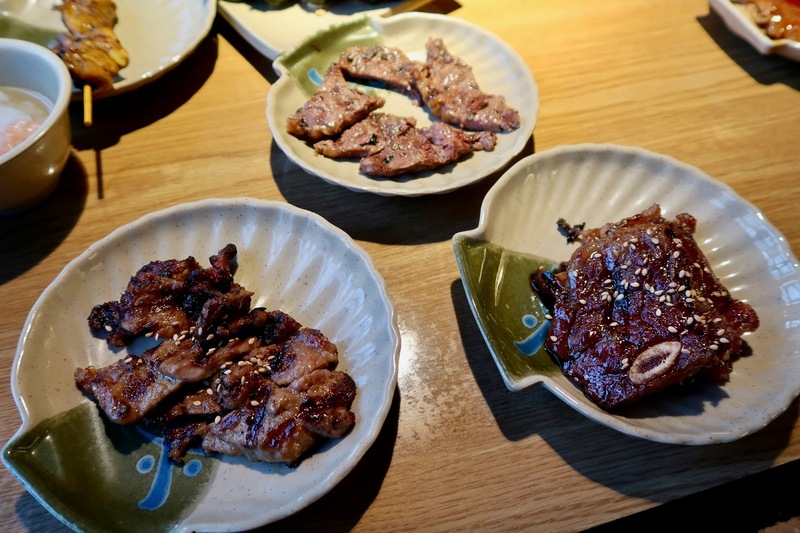 Overall, the food quality was in line with what I expected for an all-you-can-eat restaurant. 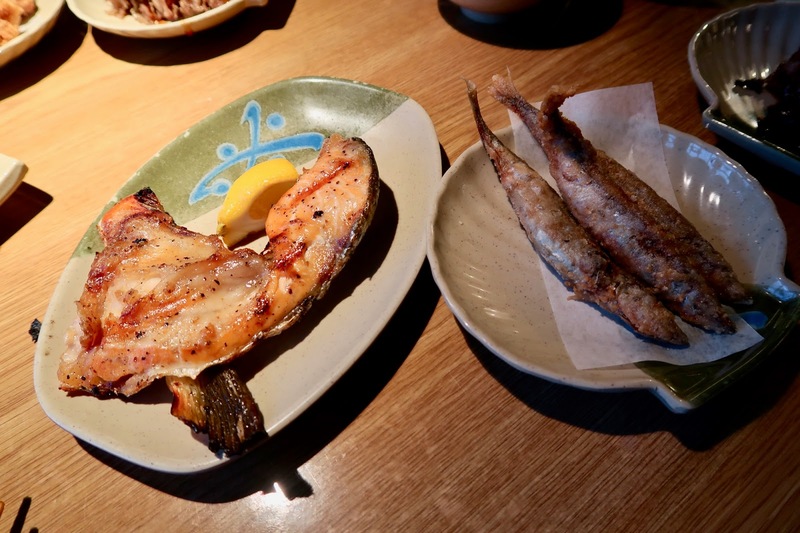 At Tomokazu, there are fewer fancy items on the all-you-can-eat menu, but the prices are also lower. Tamsen and I were back at it with the escape games, and this time, we planned to solve multiple escape rooms back to back. Of course, we needed our fuel. Now, Tamsen likes bubble tea just as much as I like sushi, so somehow, we had to fit an epic sushi adventure and bubble tea all into our stomachs in one go. It was a miracle that I did not collapse on the floor with an epic food coma. Hopefully, I burned off at least 5,000 calories with each escape game. 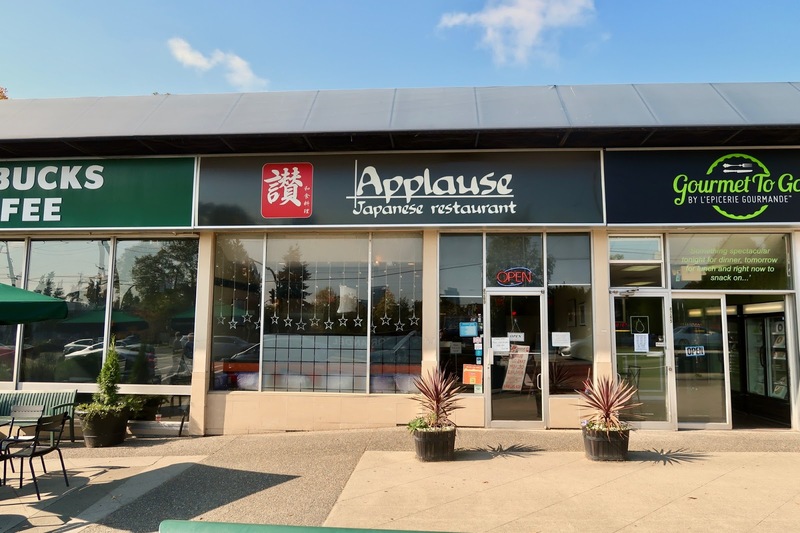 Applause Japanese Restaurant is a moderately sized sushi restaurant located in a small row of stores near the south end of Oak Street. It's not hard to find, but neither is it easy to find. I had to keep my face glued to the window while riding the 17 bus in order to not miss it, and... well... Tamsen just walked the wrong way when trying to get to the restaurant. I think I got a decent suntan by the time he arrived. 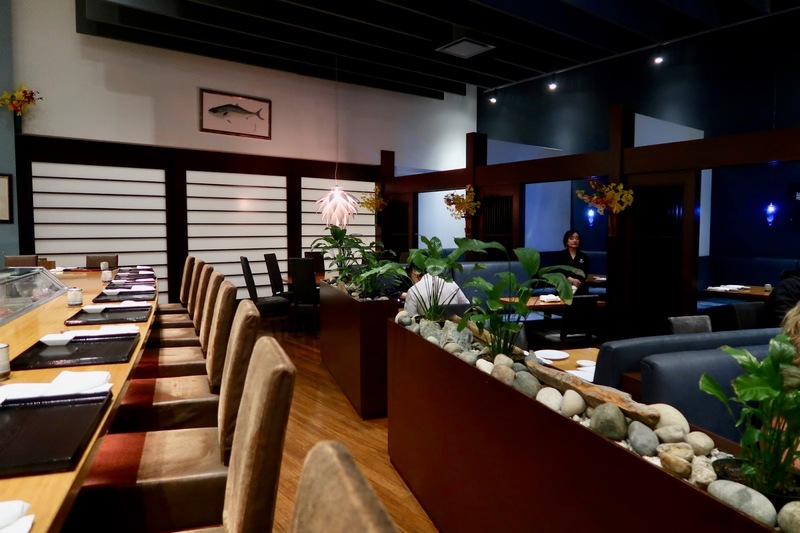 Inside, we found that it was moderately busy on a weekday for lunch. 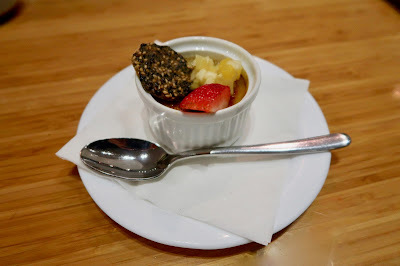 There is a good variety of items on the menu, including some appetizers that were not commonplace dishes. 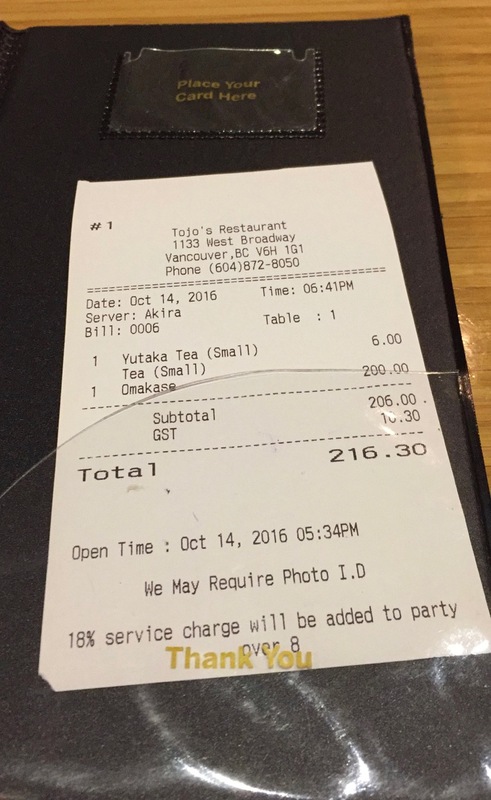 The servers were welcoming and friendly, although they were a little forgetful at times. When I wanted a spoon for my Miso Soup, I had to ask three separate times before successfully receiving said spoon. As Tamsen remarked, "the third time's the charm." 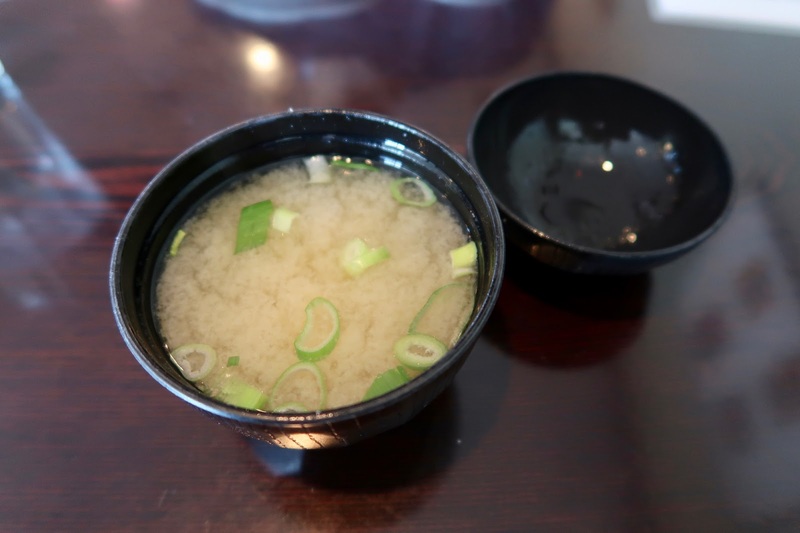 The Miso Soup, featuring seaweed, green onion, and tofu, featured well-balanced flavours. The consistency was slightly on the thinner side. 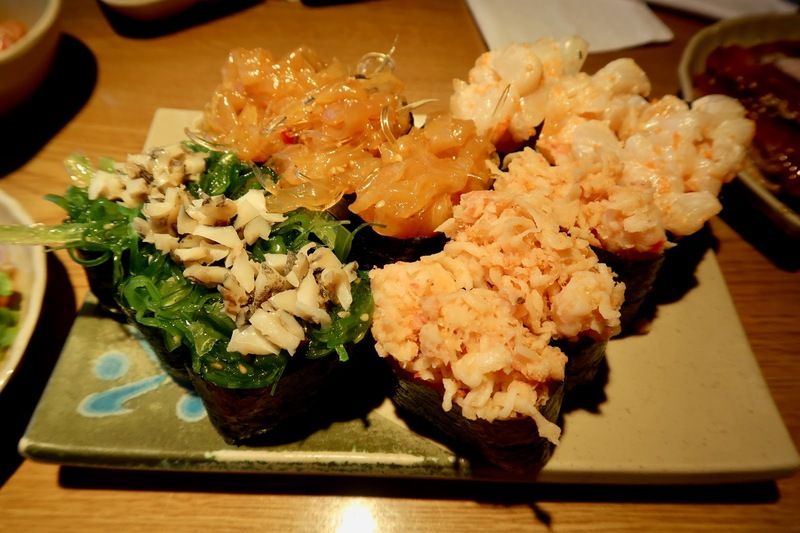 The cutting on the Appetizer Sashimi was a little flawed, and many of the pieces had ragged edges. The sockeye salmon tasted fresh, but the texture was not especially smooth. 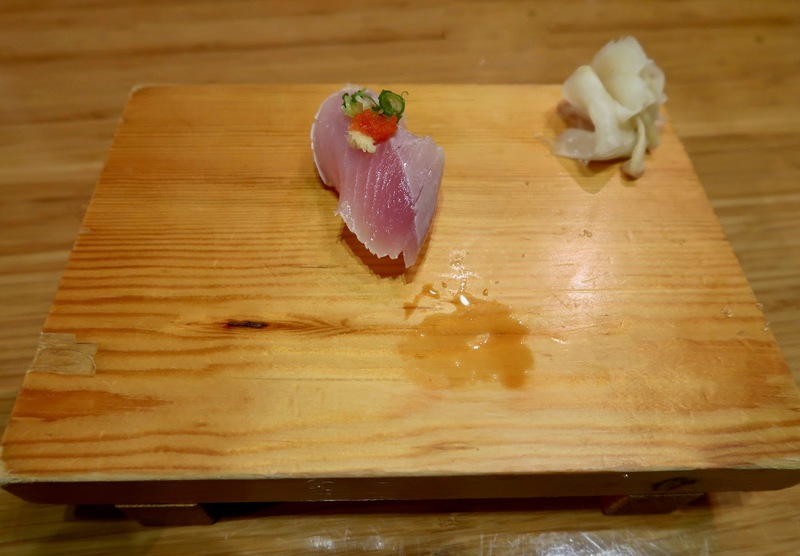 Freshness was not as apparent in the Tuna Sashimi. 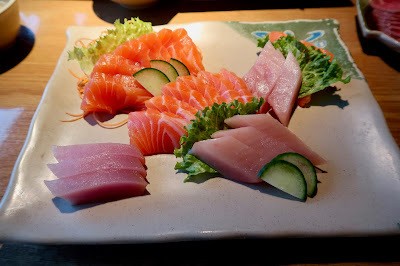 On the plus side, the sashimi came in rather generous slices. 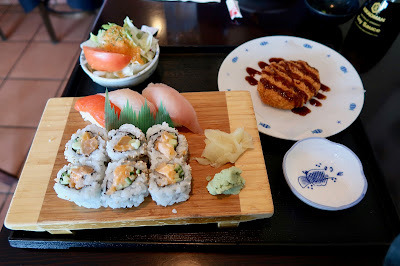 Next, Tamsen had the Scallop Sushi Combo, which came with a House Salad, a Yasai Croquette (vegetable croquette), three pieces of nigiri (salmon, tai, tuna), and a Chopped Scallop Roll. 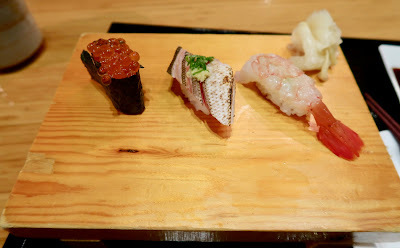 Since I had ordered my own nigiri, I tried some of everything besides the nigiri. The House Salad was featured mainly lettuce and tomato and was quite refreshing. It came with a tangy, citrusy vinaigrette and had ample moisture. 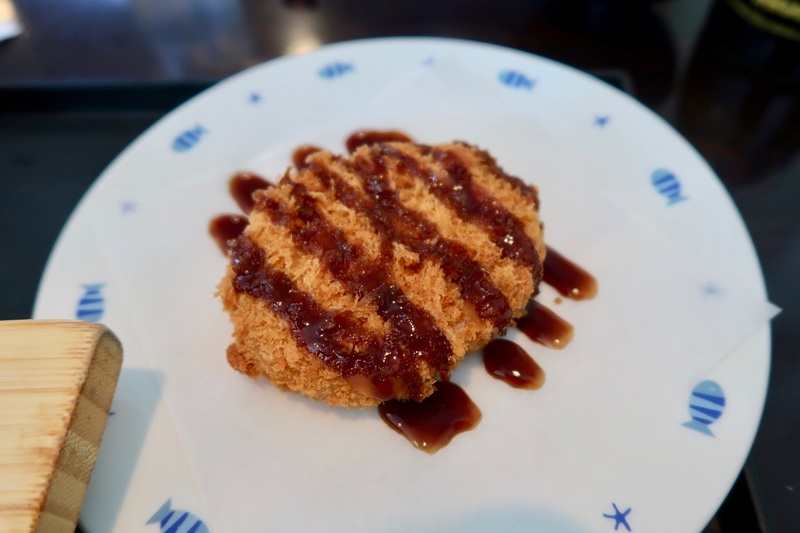 The highlight of our meal was the Yasai Croquette, which contained corn, peas, and carrot. The crispy panko batter had just the right amount of crunch and was not hard. 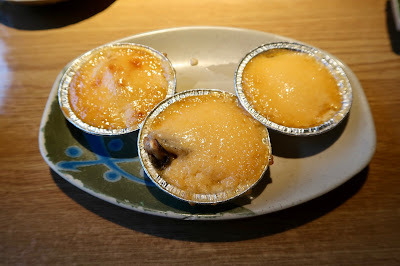 The filling inside was very soft and savoury and was an excellent contrast to the crispy exterior. The Chopped Scallop Roll was also largely successful. The mayonnaise brought the flavours together well, and the sesame seeds accentuated the roll nicely. If anything, the roll would be better with a little less rice. Unfortunately, the Saba Nigiri was quite disgusting. 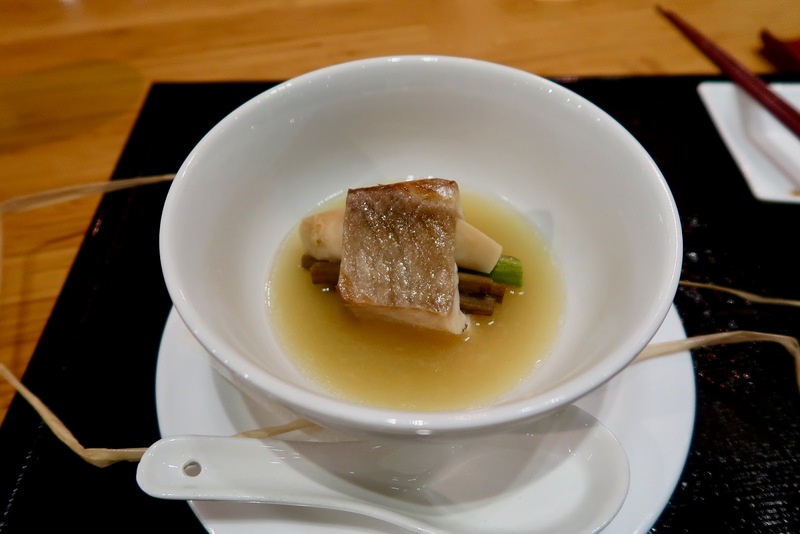 The saba was all mushy and tasted like it had been through a hurricane and then left to lie in a puddle for days. Not even the zing from the green onion and ginger was able to remotely save it. 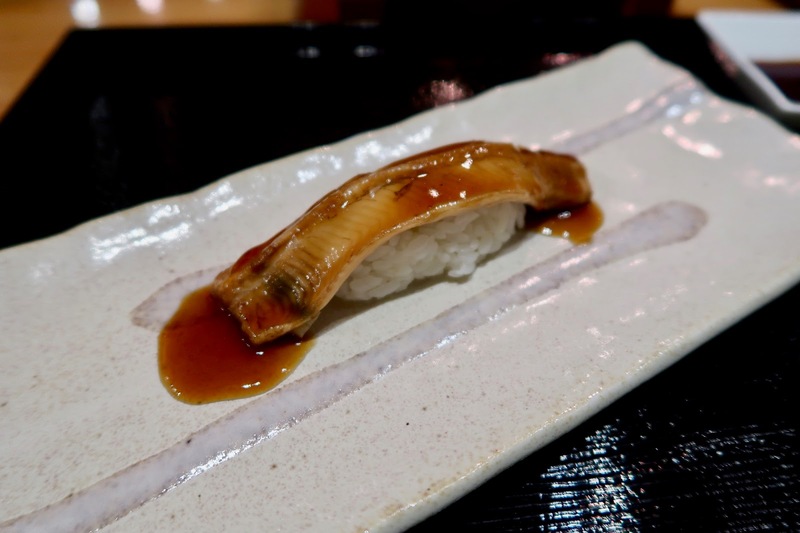 The Unagi Nigiri fared better with some soft unagi and sweet unagi sauce. There was still an overage of rice, and the rice was packed too tightly. The Enoki Gyuu Maki (enoki mushrooms wrapped in beef) was a well-executed appetizer that came with savoury, teriyaki-like beef. The sesame seeds did wonders to the maki. 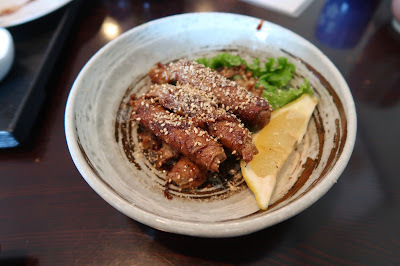 The beef was not tough, and the enoki mushrooms absorbed the teriyaki flavour nicely. 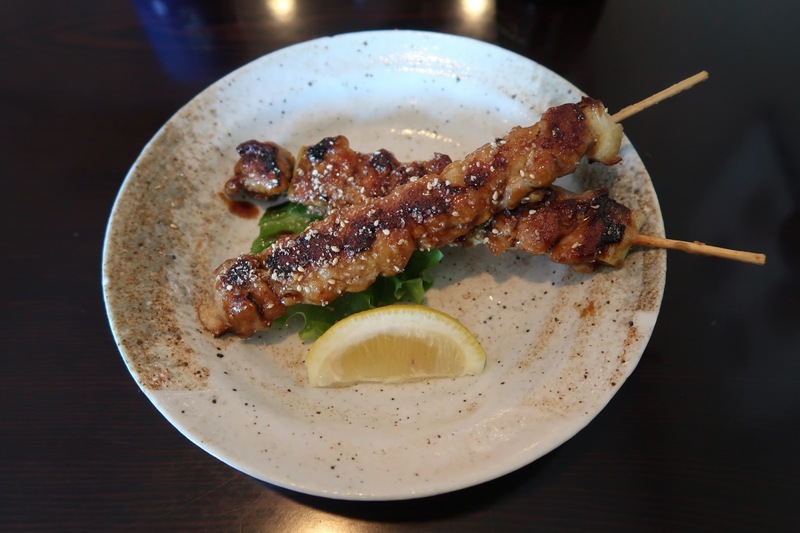 Our other cooked appetizer, the Yakitori (BBQ chicken skewers), came with a generous amount of flavourful, tender chicken. However, the chicken ended up a little soggy. By the time we were both starting to feel full (uh oh), the Red Dragon Roll came. 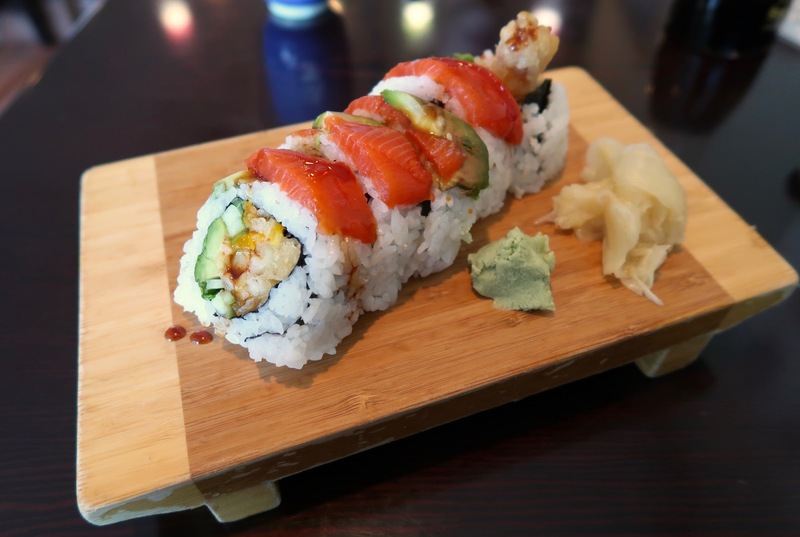 This roll consisted of salmon, avocado, and shrimp tempura. We both thought the roll was a little pricey at $9.25 for 5 pieces, but at least each piece was quite large. 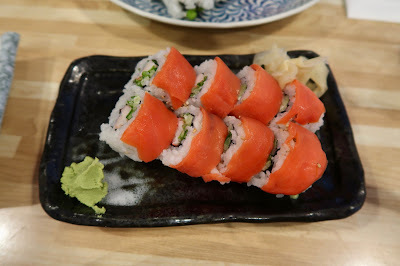 The sockeye salmon on top was tasty, but some of the ingredients inside were a little soggy. The tempura batter was also a little harder than expected. The service remained prompt and friendly throughout our meal. 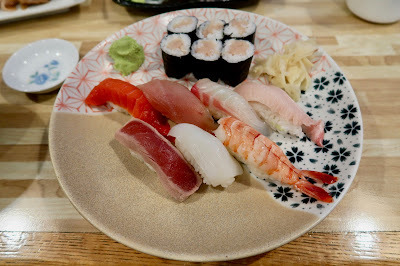 The food was above average compared to other sushi restaurants in the area, though the consistency can be improved. Overall, we enjoyed our visit largely due to the unique, well-executed appetizers. 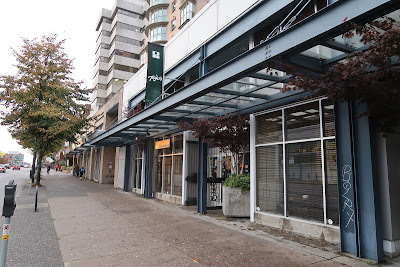 I don't venture out to Surrey all that often, but this time, it was to have a long-due lunch with Xtrain. I credit Xtrain for training me to write well enough to create this blog. He has perhaps the sharpest eyes out of anyone I know. I would present to him a one-page piece of writing that I had proofread and revised for several hours, and within two seconds, he would be able to find a missing comma smack in the middle of the page. He always loved to give me a hard time. 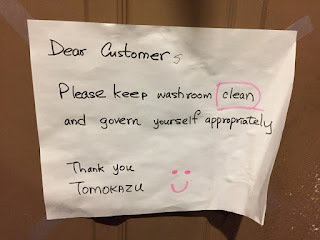 However, we went to Tokachi just to have a good time, and luckily for me, missing commas are not something I need to worry about when I am just eating sushi. 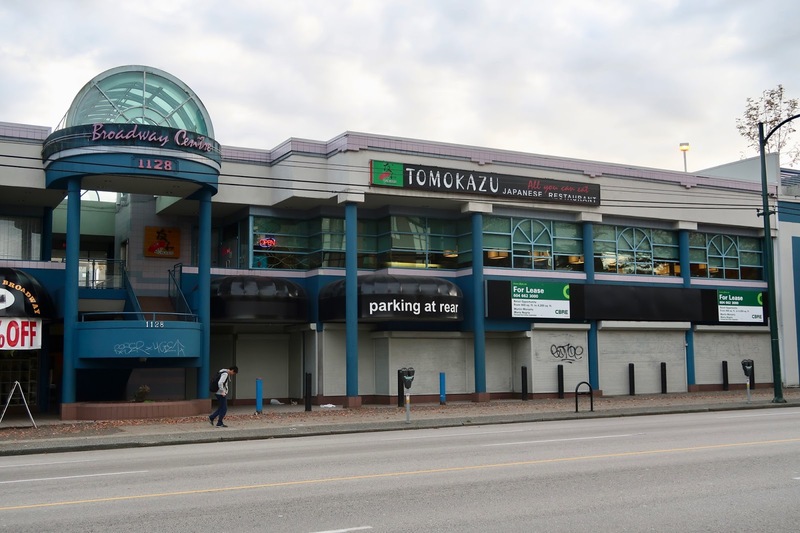 Xtrain knows the Surrey food scene better than I do, so I asked him where to go for sushi in Surrey. 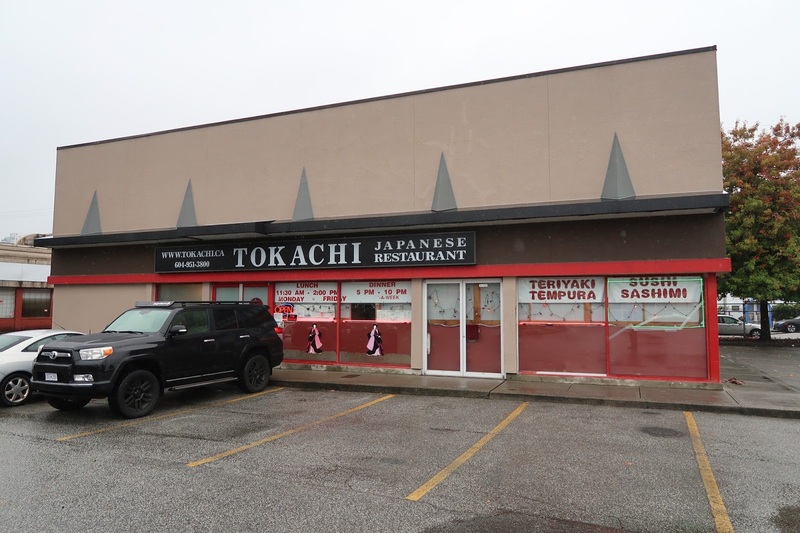 He suggested Tokachi, an authentic Japanese restaurant in the heart of Whalley. 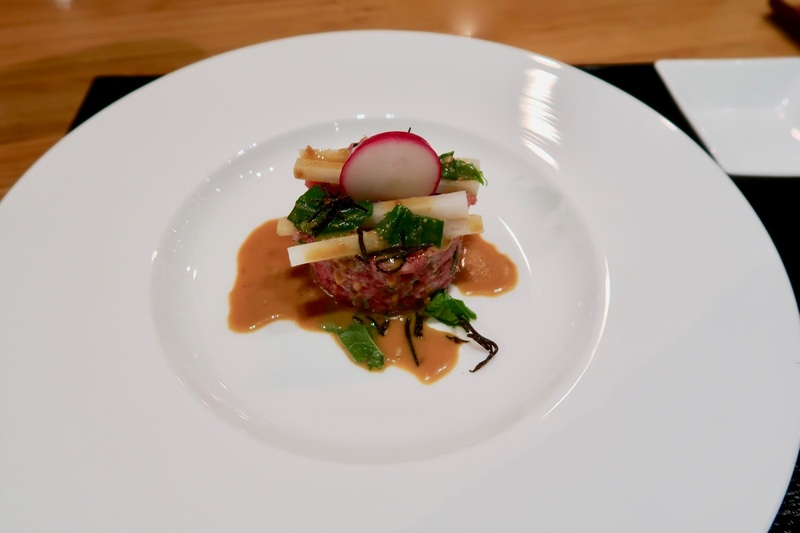 I have heard many great things about Tokachi's food and service, but I've never visited the restaurant before because I could not gather the courage to walk the two blocks there from Gateway Station. After all, Sherman once tried to visit Tokachi and found that it was cordoned off by police tape due to a shooting. Having someone to dine with put me back to my senses and reminded me that it's okay to walk around in Whalley as long as there is sushi involved. In contrast to the very worn-down look of the exterior, the interior is actually very nicely designed and maintained. The dining area is very spacious, and there are small tatami rooms in the back for larger groups. 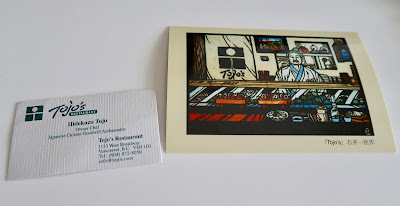 Each waitress was dressed in a yukata, which added to the authentic feel. 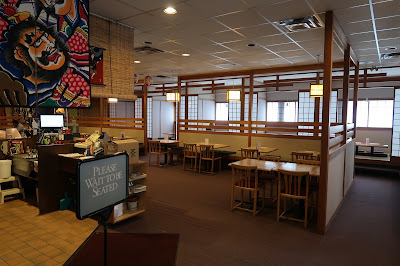 Funny enough, when I whipped out my camera to take a picture of the dining area, all the waitresses swiftly ran into the kitchen to hide from me. 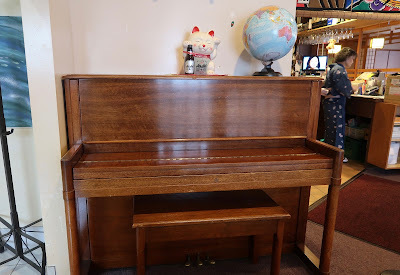 Do I get free sushi if I play a song? We each received a Miso Soup to start the meal. 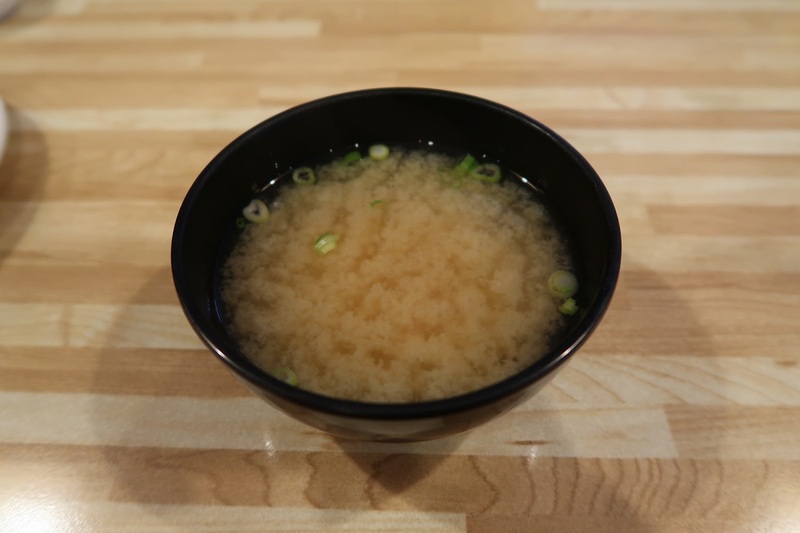 With green onion and tofu, this Miso Soup had a strong miso flavour and was served at a nice, hot temperature. The consistency leaned towards the thinner side. Next, I had the Assorted Sushi combo to test out their various nigiri offerings. 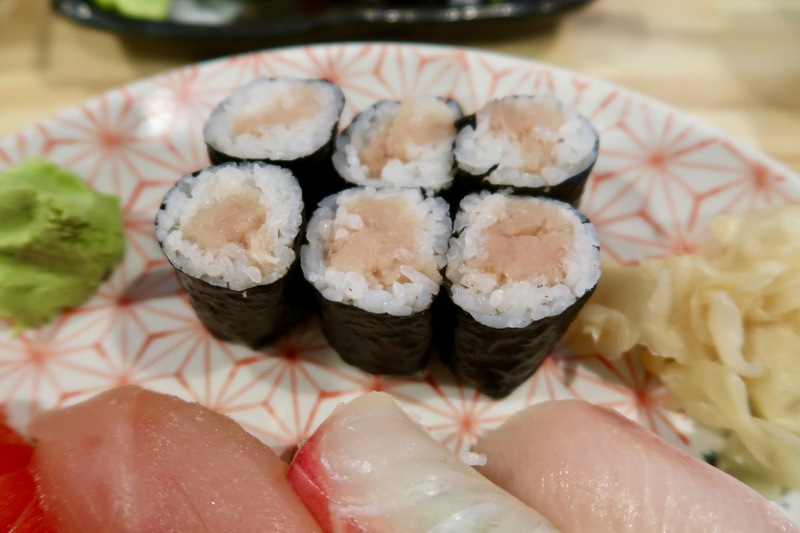 The Tuna Roll came in rather large pieces and featured soft, savoury tuna. 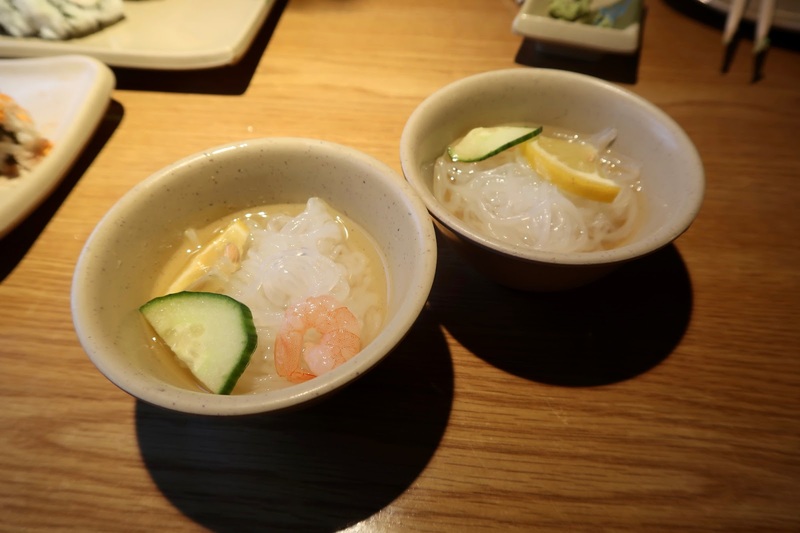 The sushi rice had sufficient flavour as well. The nigiri turned out to be a treat. While not the best I've encountered, it was very good for the price range. It was around the same level as Sushi by Yuji. Among the best were the soft, buttery, sweet tai (snapper) and the creamy, melty hamachi (yellowtail). I also enjoyed the Ika Nigiri (squid), which was savoury and did not have that slightly sticky texture present in a lot of the ika I've had in the past. Freshness was apparent in every piece. Xtrain is a big fan of salmon, so we got the House Roll, which consisted of steamed prawn, smoked salmon, cucumber, and radish sprouts. It was a unique blend of flavours that worked, and the crunchy, meaty prawn took the spotlight. 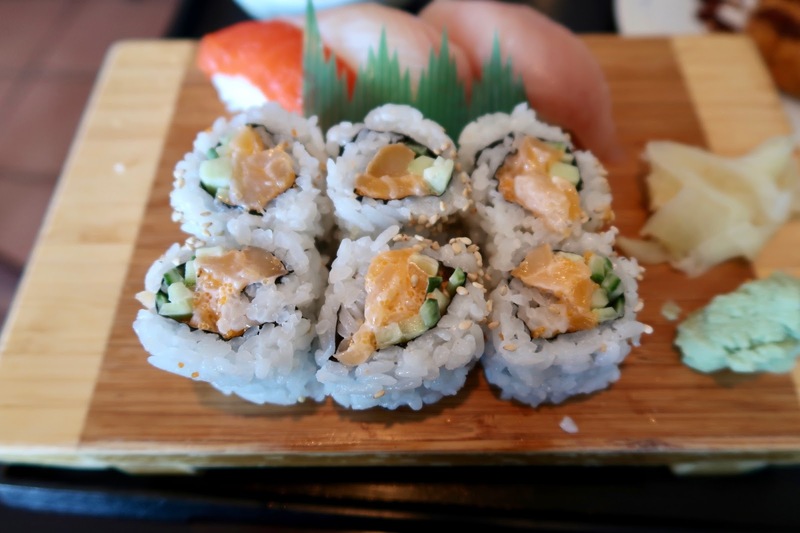 The cucumber also added to the crunchiness of the roll. The Tuna Gomaae was by far the most novel item of the meal. Since the word "Gomaae" was in the name, both of us were expecting a small salad to accompany the tuna, but that was not the case here. (No, that one leaf does not count.) 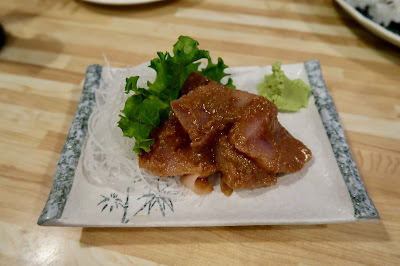 The tuna was covered with a sweet soy sesame sauce that produced a strong, nutty zing. The tuna itself was of very high quality and had an excellent soft and melty texture. The service was very polite and friendly. Xtrain remarked to one of the waitresses that I had a big appetite (which is true for the most part), so she asked me if I needed another combo after we had finished all the food on the table. Unfortunately, it was too early in the morning (ahem, I mean afternoon), and my appetite had not really fired up yet. 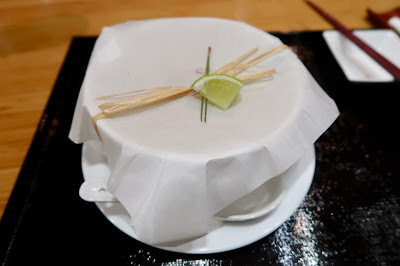 I wish I did have the stomach room though, as the food was consistently well-executed. Tokachi is certainly one of the better Japanese restaurants in the area, especially given the reasonable prices.